Its Brews by the Bay 2009 Trivia Time! Who Wants Tickets? As promised, Jerm is here with some stuff to giveaway to some lucky individual! Whats the prize you may be asking? Well I hope you like beer, food and wine, because what your playing for involves plenty of both! That&apos;s right! 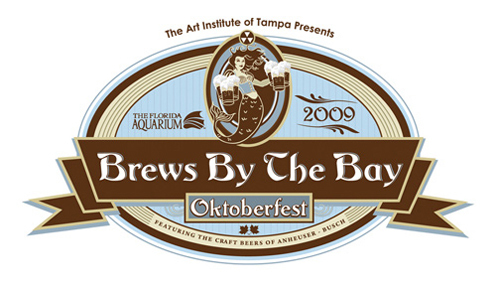 Your playing for two tickets to Ocktoberfest Brews by the Bay 2009! this Saturday at The Florida Aquarium! I can just about guarantee you that this is going to be a great event as we all know those guys over at the Florida Aquarium know how to party! That is evidenced by the fact that there will be plenty of food from local vendors, live entertainment, great exhibits, and 35 unique craft beers from all over the world. So I bet by now you are wondering, how do I win? Well its pretty simple, just follow these quick and simple rules below. Now, keep in mind that if you don&apos;t win today, that I will be doing another one of these tomorrow so you have another chance. Even if you don&apos;t win, that&apos;s no excuse for you to miss this great Tampa Bay area events like this, so hurry up and get your tickets! Here are the rules again, just in case you forgot...1 - You have to be following us on Twitter.com (www.VisitTampaBay.com/Twitter); 2- Answer two questions about The Florida Aquarium 3 - You have to re-tweet the original tweet in order to be eligible to win (a lot of people forget this one, so make sure you re-tweet separately); and 4 - You have to answer the question(s) on Twitter and be the first to do so. Name the type of Penguin featured in the Penguin Promenade exhibit at the Florida Aquarium? The Coral Reef Exhibit in the Florida Aquarium actually simulates this actual reef near Key West, Florida? Okay I think I stumped you guys today so I will give you a hint and tell you that both answers can be found on the Florida Aquarium website. p.s. if you have won in the past 30 days, you can still take a stab at the answer, but are not able to win this go round.